The Fan’s Choice for Kpreps Game of the Week featured Eight-Man, Division I No. 4 Spearville at No. 5 Hodgeman County. Spearville jumped out to a 28-0 lead and rolled past the Longhorns 50-28. Lancer quarterback Nathan Stein totaled more than 250 yards of total offense and scored six touchdowns to lead Spearville. Spearville is the District 7 champion as a result of the win. The Royal Lancers advance to the playoffs for the second consecutive season. Hodgeman County, last season’s state runner-up, now must win on the road at Ness City to reach the playoffs. Spearville defeated Ness City 50-38 back in Week 5. In Class 6A, the eyes of the state were set on a showdown between the Sunflower League’s fourth-ranked Olathe South Falcons and the Eastern Kansas League’s No. 3 Blue Valley Tigers. This one didn’t turn out to be much of a game as Blue Valley routed Olathe South, 49-0. The Tigers put up 522 yards of total offense, including 371 yards on the ground. Will Evans led Blue Valley with 148 yards rushing and four touchdowns, while A.J. Totta added 127 yards and two scores. Blue Valley travels to Blue Valley Northwest in Week 9, while Olathe South will host winless Gardner-Edgerton. The Class 5A state title contender from the likely resides in that loaded District 4. On Friday night, some big-time performances by running backs helped their teams to district wins. St. Thomas Aquinas moved to 2-0 in district play thanks to a 52-28 drubbing of No. 5 Blue Valley West. The second-ranked Saints got a huge performance from back James Cosentino who rushed for 261 yards and five touchdowns. The Saints scored 28 points in the second quarter to pull away to a a 35-6 halftime lead. Aquinas rushed for 450 yards on the night. In the other half of District 4, Pittsburg held on to defeat Blue Valley Southwest 41-34. The Purple Dragons built a two-score lead before the Timberwolves rallied to take a 34-33 lead in the second half. Alex Barnes led Pittsburg with 30 carries for 322 yards and five touchdowns. He had 200 rushing yards and four touchdowns at halftime. The Purple Dragons rushed for 402 yards on the night. Blue Valley Southwest had on last chance on fourth down at around midfield with less than two minutes remaining. Quarterback Collin Gallery was flushed out of the pocked and found an open receiver downfield beyond coverage, but the ball was dropped. Speaking of loaded districts, District 8 in Class 4A-I feature two more great games on Friday night. McPherson edged No. 3 Buhler 44-42 behind an outstanding night from senior quarterback Kyler Kinnamon. The Bullpups and Crusaders hooked up in a classic game that featured two ties and seven lead changes. McPherson had the largest lead of the game at nine points (44-35) after Kinnamon scored his second rushing touchdown of the night. Kinnamon had a part in all six Bullpup touchdowns on the night. He rushed for two scores, passed for three touchdowns and returned an interception 56 yards for another touchdown to give McPherson a 24-21 lead late in the second quarter. The other match-up in District 8 featured a pair of one-loss teams in Hays and Abilene. Hays scored on an Alex Delton 15-yard run mid-way through the fourth quarter to win 34-33. Abilene led 27-21 at halftime, but Delton broke a 90-yard touchdown run to tie the game at 27 in the third quarter. The Cowboys responded with a touchdown pass from Hartley Hazlett to Tanner Hoekman to retake the lead at 33-27. The PAT was blocked leaving the door open for Delton and Hays winning score. Lawrence Free State jumped out to a 21-0 lead in the first half and held off Manhattan, 35-14. Bryce Torneden passed for more than 100 yards and three touchdowns in the opening half to pace the Firebirds. Manhattan pulled to within 21-14 in the third quarter when Eric Prockish hit Jake Owens on a 45-yard touchdown pass. Torneden would add a touchdown run to build the Firebird lead to two scores, and Free State would get a Zack Sanders’ pick-six in the fourth quarter to seal the win. As a result, Lawrence Free State and Topeka High have qualified for the playoffs out of District 5. After starting the season 6-0, Manhattan will fall short of the 6A playoffs. Frontenac took a huge step in claiming the CNC League championship by picking up a 22-13 road win over No. 3 Columbus. The fourth-ranked Raiders trailed 7-0 at halftime after Jace McDown scored for Columbus late in the first quarter. Frontenac got on the board in the third quarter on touchdown pass on what was an apparent botched field goal attempt. The Raiders added the two-point conversion and the 8-7 lead. Columbus drove deep into Frontenac territory after when the game switched on two consecutive plays. Frontenac’s Cadin Bolinger intercepted a Titan pass in the end zone for a touchback. ON the very next play, Bolinger went 80 yards for a touchdown and a 15-7 Raider lead. McDown would strike again on a 9-yard run to pull Columbus within 15-13 early in the fourth quarter, but the two-point conversion attempt failed. Frontenac would add another touchdown to take a two-score advantage. Elsewhere in 4A-II, Holton trailed Perry-Lecompton 20-7 early in the second quarter before coming back to blast the Kaws, 56-27. Top-ranked Andale methodically beat Clearwater 21-0 to stay unbeaten. In Class 3A, Norton raced out to a 27-0 lead and held on to beat Beloit 34-16. Caney Valley scored 35 unanswered points to top Neodesha 35-29. The Blue Streaks led Caney 20-0 early, but the Bullpups rallied to allow them to claim another Tri-Valley League title. Hutchinson Trinity remained unbeaten with a 42-10 win over Kingman. Wakefield came in fighting for their playoff lives against No. 2 Osborne and almost pulled off the upset. The Bombers led 12-0 early and by as many as 28-12 with 3:30 remaining in the first half. Osborne pulled to within 28-26 by halftime. In the second half, Osborne built a 48-34 lead with 8:18 remaining before Wakefield responded with a pair of scores to tie the game at 48. The Bulldogs and Bombers went into overtime with Osborne coming out on top, 56-54. As a result, defending-champion Osborne qualifies for the playoffs out of District 4 along with top-ranked Hanover. The Bulldogs and Wildcats will meet next week to decide the district championship. Wakefield will miss out on the playoffs for the eighth consecutive season. In Eight-Man, Division II, No. 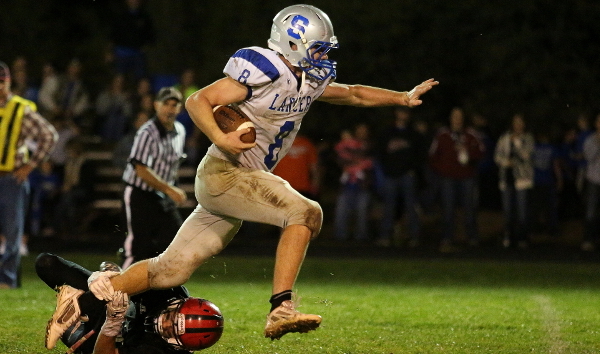 5 ranked Beloit St. John’s-Tipton edged No. 4 Thunder Ridge 54-50. The Blujays led 22-20 at halftime and expanded their lead to 48-32 in the fourth quarter on a touchdown pass from Trey Dubbert to Davis Dubbert. Thunder Ridge pulled to within 48-44 with 2:34 remaining, but St. John’s-Tipton responded with an Aaron Henke touchdown run made it 54-44. Thunder ridge scored with 8 seconds remaining to pull within 54-50. Finally, top-ranked Chetopa ran only 13 offensive plays in a 96-0, halftime win over Elk Valley.